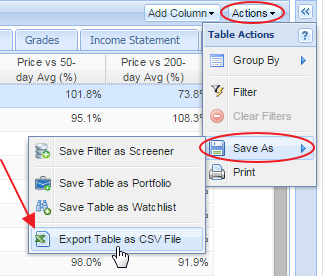 To export the data that is displayed in the Table to a csv file, click the ‘Actions’ button in the Table’s toolbar, mouseover ‘Save as’ and select ‘Export Table as CSV File’. You can also choose to add this action to your Start menu shortcuts. 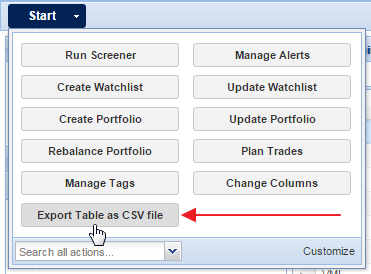 This will download all displayed tickers and columns to a csv file in the folder designated by your browser. The file will only contain the tickers displayed in the Table, so if there are tickers spread out over multiple pages, you will have to export each page individually. Please note that range-style graphical columns (such as 52-wk range) will display the lower and upper limit values, whereas histogram-style graphical columns are unable to be exported and so will show a blank value.